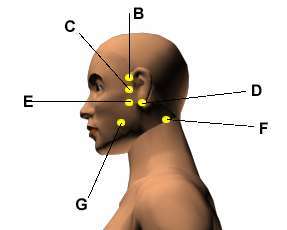 There are the acupressure points for relieving Jaw Problems. Working on these points can help you get better quicker. You do not have to use all of these points. Using just one or two of them whenever you have a free hand can be effective. Location: Below the base of the skull, in the hollows two to three inches apart depending on the size of the head. Benefits: Relieves jaw pain, and other related problems such as headaches, stiff necks, and neck pain. Location: one-half inch above "Wind Screen" Points (D). Benefits: Relieves jaw pain and the following head pains: earaches, pressure inside the ear, TMJ problems, toothaches, and headaches. 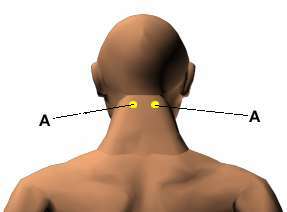 Location: It is directly in front of the ear hole in a depression that enlarges when the mouth is open. Benefits: Relieves jaw pain and the following head pains: earaches, pressure inside the ear, TMJ problems, toothaches, and headaches. Location: In the indentation underneath the earlobe. Benefits: Relieves ear pain, facial paralysis, facial spasms, jaw pain, damp and itchy ears, throat swelling, mumps, and toothaches. Location: one-half inch below "Wind Screen" Points (D). Benefits: Relieves jaw pain and the following head pains: earaches, pressure inside the ear, TMJ problems, toothaches, and headaches. Location: Below the base of the skull, in the hollows two to three inches apart depending on the size of the head. Benefits: Relieves jaw pain, and other related problems such as headaches, stiff necks, and neck pain. Location: Between the upper and lower jaw, on the muscle that bulges when the back teeth are clenched. Benefits: Relieves jaw pain and spasms, TMJ problems, lockjaw, dental neuralgia, and toothaches.